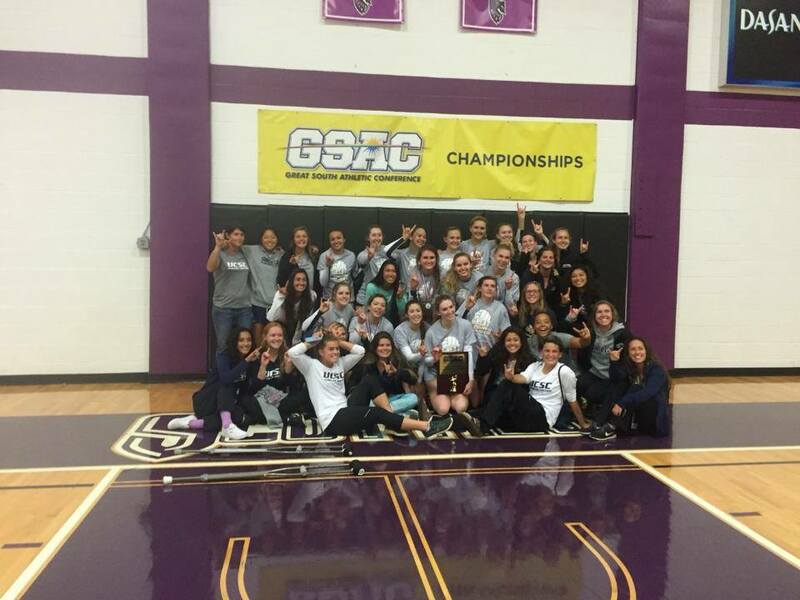 Women’s volleyball and soccer teams celebrate GSAC championship titles. Photo courtesy of Morgan Henry-Ehritt. Last summer four UC Santa Cruz women’s programs — basketball, soccer, tennis and volleyball — made the move from independent teams to the Great South Athletic Conference (GSAC). The UCSC athletics department hoped this would end the frequency of its teams earning a strong record but failing to advance to the NCAA postseason because of their position as an independent program. Independent teams are only allocated one at-large bid, and cannot win a conference tournament to earn an automatic spot in the NCAA tournament. This fall the Slugs used their new conference, with both women’s soccer and volleyball winning the GSAC tournament last weekend in Georgia, to have a shot at the coveted NCAA Division III championship. Both teams will play in the first round this weekend, and must defeat top division seeds to keep their seasons alive. The Slugs dominated the GSAC tournament in Georgia last weekend, sweeping both their competitors, to place themselves in the first round of the NCAA tournament on Nov. 13. UCSC first defeated Salem College (4-16) 25-11, 25-21, 25-8 in the semi-final match before taking on Agnes Scott College and winning 25-12, 25-13, 25-13. The Slugs were top-ranked in the conference tournament, and for the first time in program-history clinched an automatic bid after not advancing last season despite an 18-5 record. The team is on a five-game winning streak and hope to keep it alive, as it faces Washington University in St. Louis, who are 32-2 on the season. It will be a tough match for the Slugs, as the Bears have only lost to No. 9 Cal Lutheran and No. 2 Emory this season. Washington is currently ranked No. 1 in NCAA Division III and are riding a 10-game winning streak, including the University Athletic Association Championship game. The last time Washington won the NCAA tournament was in 2009. The young team rosters just three seniors, but have a strong class of underclassmen including outside hitters Tatum Novitzky and Maya Lloyd who lead the team offensively in kills. Novitzky and Lloyd, along with Allison Ota and Kellie Graves were named to the 2015 GSAC all-conference team. Junior setter Sophie Seiberth was named all-tournament MVP after she averaged 22 assists per game throughout the tournament. The squad will face off against Washington University in St. Louis at Cal Lutheran’s Gilbert Arena on Nov. 13 at 3 p.m.
For the first time since 2011, the women’s soccer team will make an appearance in the NCAA Division III tournament. After tying Salem College 0-0 in double overtime in the GSAC championship match, the Slugs won a penalty kick shootout 4-3 to secure a spot in the postseason. Going into the conference tournament 4-10-2, UCSC had to win the conference to keep its season going. The Slugs, ranked No.1 going into the tournament, earned a bye in the first round of the tournament. In the second round, the Slugs beat No. 3 conference seed Agnes Scott College 1-0 with the lone goal courtesy of junior Megan Carey in the second half. Carey led the Slugs offensively all season, with eight goals on the year, three of which were game-winning. The tournament win is one of many celebrations this weekend, as GSAC coaches voted senior Rika Goto conference player of the year during the GSAC banquet last Friday night. Goto started all matches this season and last season, and has been a key defensive player for the Slugs. Goto also scored the game-winning PK against Salem College last Sunday afternoon. On Nov. 13 UCSC will travel to San Antonio, Texas to face-off with Hardin-Simmons University in the first round of the NCAA tournament. The HSU Cowgirls are 17-2-1, and are an offensive powerhouse with four players netting over 10 goals on the season. Top scorer sophomore Kami Jones has 25 goals this year. Last weekend the Cowgirls defeated Texas-Tyler 2-0 to earn its 13th straight American Southwest Conference women’s soccer championship.